I'm not voting for Bill Thompson. Wayne Barrett, formerly a public favorite at Village Voice magazine, has it right. You may want to know why Thompson's Campaign Worker Hank Sheinkopf took the 5th Amendment on the stand at the court hearing on the Racino Scandal. I certainly do. Price, right, would not directly answer questions about his arrangement with Thompson, but his explanation paralleled Thompson’s. “His work for Kurron Capital was to guide us on shifting to become a private equity firm. He wasn’t involved in the operations of the company on health care, consulting or restructuring,” Price said. A Kurron intimate explained that Price’s general counsel, Pam Bradshaw, worked directly with Thompson, who functioned “more as a consultant,” advising Kurron on the “pursuit of private equity opportunities.” All the Kurron companies had a single shareholder, Price, and shared an office on Third Avenue. As comptroller, Thompson was Wall Street’s conduit to the city’s $130 billion in pension funds, which the comptroller serves as investment advisor, custodian and trustee. And his principal employer after he left office has been a public finance firm, Siebert Brandford & Shank, which paid him $680,000 last year. But he joined Kurron when it was a sinking ship. Just how much Thompson has been paid by Kurron isn’t clear. The disclosure form he filed with the state as chair of the Battery Park City Authority says he was a paid member of the advisory board of Kurron Shares, a sister company to Kurron Capital, Interfaith’s management company, in 2010 and 2011. The state form doesn’t list his earnings, stating only that Kurron was a source of income over $1,000. Another disclosure form, which mayoral candidates filed with the city last week, contained no reference to Kurron, indicating Thompson’s advisory service ended in 2011. Of course, none of this was Thompson’s business at Kurron. But the problems made his experience particularly relevant to Price, who explained that he was “shifting direction” to private equity because his other businesses were drying up. Kurron’s battles over Interfaith peaked as Thompson apparently was exiting the firm. Indeed, the medical center’s bankruptcy papers read like an expose of Price and Kurron, as well as an autopsy of a gutted hospital. IMC filed on December 2, 2012 – three days after awarding a new $3.25 million contract to Kurron, some $250,000 of which was paid the day before the contract was signed. The contract, which had to be approved by the bankruptcy judge, called for Kurron to continue managing the hospital and become its “restructuring adviser” during the bankruptcy process, with Price as Chief Restructuring Officer and CEO. The rationale was that Kurron knew interfaith so well it was the only consultant that could salvage it, and the judge eventually approved the deal. The U.S. Trustee that oversees bankruptcies, - joining 1199, the nurses union and the hospital’s creditors – filed objections to the Kurron deal. The independent trustee found that Kurron “could be an impediment to reorganization,” questioning its ability “to fulfill its fiduciary duty.” Price’s 35-years in the health care business, featuring restructuring experience, was one of the reasons Kurron won the court battle. He promised the judge in court and in writing that he would be a 40-hour-a-week CEO and restructuring chief. But the briefs from the unions told another tale. The hospital workers union accused Price of a “shockingly cavalier attitude,” arguing that he had not been “present physically” though the first months of the bankruptcy period. The nurses cited the observations of their own members, who said Price hadn’t been there “a single day” and had no office or secretary at Interfaith, refusing to respond to requests for even a conversation. The hospital’s patient ombudsman said Price wouldn’t meet with him, and only talked to him once for five minutes. Price responded in court to these allegations by listing a handful of phone inquiries he made about Interfaith, mostly to bankruptcy lawyers and consultants. Kurron also accused the objecting creditors of “prioritizing union interest.” In March, the judge singled out Price personally and dropped him from the contract, approving a new restructuring chief with no ties to Kurron to guide the bankruptcy. Polished, bejeweled and engaging, Price - a registered Republican who serves as a trustee of his alma mater, Ohio State University – works mostly out a Harlem townhouse on West 148th Street he’s owned for years. He bought a $4.9 million condo in 2008 at 15 Central Park West, where Lloyd Blankfein of Goldman Sachs, Denzel Washington and Sting also had apartments and chauffeurs have a waiting room. Kurron sometimes used it for business purposes, but Price sold it in 2011, around the same time that Kurron closed its headquarters office at 885 Third Avenue, where Thompson and Price usually met at awkward two-member “board meetings.” The 800 number on Kurron’s neglected website is dead. Perhaps Price’s most ambitious undertaking – and most ignominious fall during Thompson’s formal association with Kurron – was his detour to Bermuda. Price won two of the small country’s biggest consulting contracts in 2007, shortly before “a friend” of his, as the island’s Royal Gazette newspaper described the new premier Ewart Brown, took office in 2006. Charges of cronyism had risen when Kurron beat out the much larger and more prestigious Johns Hopkins University for a plum assignment at the center of the nation’s healthcare system. Officials in Bermuda attributed Price’s bonanza to the premier’s ex-New Yorker wife, Wanda Henton-Brown, a onetime New York investment banker whom Price had known for years; in the ’90s, they summered in nearby houses on Martha’s Vineyard. That’s also when Price steered a huge bond offering from Interfaith to the fledgling investment firm Henton-Brown had just founded herself. More recently, Price has given to Henton-Brown’s Bermuda foundation. Messages left for Henton-Brown in Bermuda were not returned. An opposition party leader, Louise Jackson, called Price’s fees “absolutely obscene” on the floor of Parliament. Price’s 34-year old son Devin, a kick-boxing promoter, oversaw the Bermuda work for Kurron, sometimes conducting meetings about it at 15 Central Park West. Once Brown resigned in 2011, awash in scandal, his successor, though she was also a leader of Brown’s PLP party, cancelled Kurron’s contract – 18 months before it expired. The worst of Kurron’s problems – in Bermuda, and at Interfaith and St. John’s – came home to roost during Thompson’s association with Kurron and Price. The issue for Thompson is not whether he aided or advised Price on labor relations, Bermuda or the management of the Brooklyn hospitals. The question is why he identified himself with a company with so much baggage. Someone looking for patterns would point to past blots on Thompson’s record. Before he became comptroller, he worked in a small underwriting firm selling municipal bonds without the required license for years, and broke half a dozen securities rules. His firm signed him up for a six-hour licensing exam six times, forfeiting a $200 fee when he failed to show up each time. Finally passing the test in December 1995, he failed to meet continuing education requirements, forcing securities authorities to list him as “deficient and inactive” and temporarily suspend his license for two more years. Yet his 2001 campaign for comptroller emphasized his private sector expertise including the claim he’d sold billions in bonds, without mentioning he did it illegally. It was also revealed in that campaign that he’d filed his taxes late four of five years and had to repay by installment. In 2008, while serving as comptroller, Thompson got a highly favorable mortgage and credit line from the union-owned Amalgamated Bank, which did billions of dollars of business with his office – an episode highlighted in commercials run by Mayor Bloomberg’s 2009 reelection campaign, in which he edged out Thompson. The $1.4 million loan to acquire Thompson’s Harlem home was artificially split in half by the bank to avoid federal ceilings and secure a lower interest rate. Amalgamated’s management of city retirement funds administered by Thompson’s office grew from $174 million when became comptroller to $3.6 billion, taking its greatest leap at the same time Thompson got the favorable mortgage and earning the bank $51 million in fees. Thompson and state officials also deposited $50 million in city cash in Amalgamated, making it the biggest recipient of a special public deposit program; the number two bank in that program, North Fork, also gave Thompson a personal line of credit and loans. He also used the comptroller’s office to push high state and city officials to fund his wife-to-be’s new African-American art museum on Fifth Avenue, which was slated to open in 2009 but remains uncompleted. All this is history. The substantive issue, in the midst of a tight mayoral primary, is why Thompson decided to enter and maintain a compensated business relationship with a man with Price’s history. Besides repeating over and over yesterday that he had “nothing to do with Kurron,” that’s not a question Thompson has answered. Ben Shanahan and Tamara Smillie, a research assistant at the Nation Institute, contributed reporting. 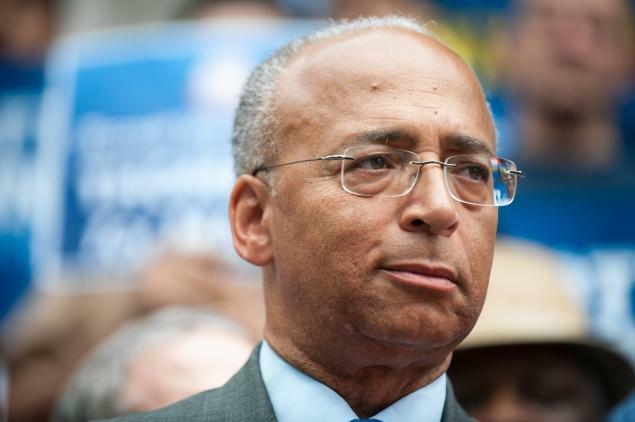 Democratic mayoral hopeful Bill Thompson is apparently over Hank Sheinkopf's having helped Mayor Bloomberg win that third term -- the ex-comptroller has hired the veteran consultant as a senior strategist. Sheinkopf's sign-on with Team Bloomberg in the '09 race -- during which he pulled in $10,000 a month in consulting fees -- raised eyebrows because of his long relationship with Thompson. "There was a time when he certainly was not happy with me, but there's a larger issue involved, and the larger issue is getting him to Gracie Mansion," Sheinkopf said of Thompson. "I'm emotionally very moved that he would want me back and working with him, and I hope that I can help to make him the next mayor of the city of New York." The Sheinkopf announcement came in a rollout of new members of Team Thompson -- including new Communications Director John Collins, a former staffer for Anthony Weiner. Policy Director Amber Green is joining the campaign from GMMB in Washington, a firm whose partners include former Weiner media guru Jim Margolis. Thompson is also bringing on more Obama veterans, including Senior Advisor Karine Jean-Pierre, who's worked on both the campaign side -- helping run battleground state ops -- and in the White House. Another ex-Obama staffer, Will Leaverton, who ran GOTV ops, will serve as Thompson's field director. More additions to the team, which already includes Jonanthan Prince and Bruce Gyory: Deputy Campaign Manager Frank Thomas, who managed Rep. Kathy Hochul's re-election bid last year, and Political Director Kim Ramos a strategist and lawyer with a network of contacts particularly among Latino electeds in the city and state Legislature. Sheinkopf isn't the only well-known consultant who worked on Bloomberg's campaign despite long-standing ties to Thompson personally or the Democratic Party at large: Others included Howard Wolfson, an inner-circle Clinton aide for many years, who also went on to become deputy mayor. No "betrayal" in his case, Sheinkopf said: He and Thompson had talked about the '09 contest, but simply hadn't been able to cut a deal. Before that, he said, he hadn't worked for the ex-comptroller since 2001. Despite being grossly outspent, Thompson ended up losing the race by only about four points. The results, far from a blowout, spurred grumbling -- and regrets -- about how more money, big-name endorsements or ground troops might very well have kept Bloomberg from scoring another four years. City Controller William Thompson and second ex-wife, Sylvia Kinard-Thompson, are battling over a piece of furniture. Controller William Thompson's divorce has turned into a nasty battle of name-calling and petty squabbles - and that's just from his lawyer. Saul Edelstein, who represented the city's top moneyman in his split from his second wife, insulted Thompson's ex in an open courtroom Wednesday as "crazy as a loon." "By the way," Edelstein said full voice to a lawyer sitting next to him in the crowded gallery of a Brooklyn divorce court, "my client's not too smart, either." Thompson's 2005 split from Sylvia Kinard-Thompson was finalized a year later - but the couple is bickering over a piece of furniture that once belonged to the controller's grandmother, Edelstein complained. His colleague agreed that Thompson - a likely candidate for mayor next year - wouldn't want his marital troubles ending up "in the Daily News." The chatty lawyers were unaware they were sitting in front of a News reporter in the courtroom's benches while they waited for their hearings to start. Most of the conversation could be heard by several people around them, and the reporter did not have to strain to listen. Thompson, 54, was supposed to be at the hearing but skipped it to attend a housing forum. So he missed his lawyer grousing that Kinard-Thompson "wants to be first lady" and her former divorce lawyer is "inexperienced" and "just as crazy as she is." Kinard-Thompson, who is a lawyer, was sitting at the other end of the courtroom and did not hear the exchange. She later threatened to take action against Edelstein for his words. "I am shocked and disappointed by those comments. I have always regarded this as a private matter. I married Bill because I loved him and because he said he loved me," Kinard-Thompson said in a statement. "As a Christian, I will continue to pray for Bill. As an attorney, I will see his lawyer in court." A spokesman for Thompson declined to comment, calling it a private matter. Edelstein could not be reached to respond to Kinard-Thompson. The self-described "dean" of Brooklyn divorce lawyers, Edelstein was more guarded about his opinions when he and Kinard-Thompson appeared before Judge Eric Prus. Kinard-Thompson represented herself at the hearing. Thompson claims his second wife took his grandmother's credenza from their former Brooklyn home. It's not worth much, maybe "a dollar and a half," Edelstein said. "It has great sentimental value," Edelstein told the judge. "She's taken that. She's not allowed to take that." The couple were supposed to get together to divvy up their furniture, but that never happened, the lawyer said. Kinard-Thompson insisted Thompson gave her the piece as a gift. "All I want is what's fair," Kinard-Thompson said. The couple married in 1999, and their divorce was settled in May 2006. Kinard-Thompson complained that Thompson has locked her out of their former Bedford-Stuyvesant house and allowed his first wife, Angela, to move in. The exasperated judge said the couple would have to share the cost of a $200-an-hour master to decide the credenza dustup unless they can work it out with a hearing officer.